I read a great article earlier today from the Wall Street Journal profiling the odd journey of the mega Brazilian bossa nova hit “Garota de Ipanema.” Read it here. The song celebrates its 50th anniversary this year, even though the tremendously popular English version (the one everyone knows) was actually released in 1964. It has taken an almost mythical path garnering a boat-load of covers and an eternal spot atop the list of elevator music. 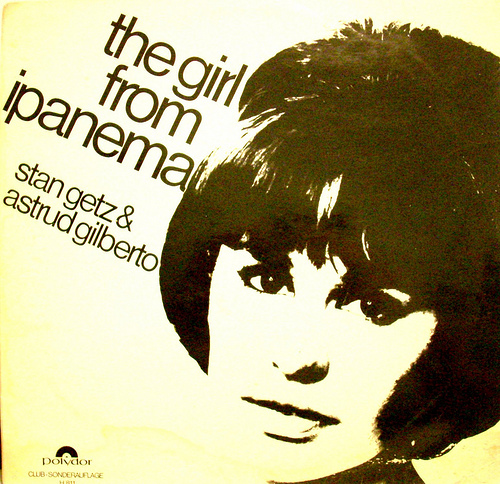 The story of the “Girl from Ipanema” is almost as classic as the song itself. There is a girl from Ipanema. Well, there are several girls from Ipanema, a Brazilian neighborhood south of Rio de Janeiro. But there was a chica who inspired the writers of this ode to the pretty girl unaware of the frenzy her appearance causes. Her name is Helô Pinheiro and at the time of the song’s creation she was a 17-year-old girl living on Montenegro Street. In the winter of 1962, composer Antônio Carlos Jobim and poet Vinícius de Moraes watched the tall, beautiful girl pass by the bar and were struck. As the article suggests, the two were stuck on a number for a musical they were writing. Helô acted as their muse. The story doesn’t end there. The song was recorded in 1962 by Pery Ribeiro and, after hearing it, U.S. music publisher Lou Levy requested an English version of the song. American lyricist Norman Gimbel (wrote the lyrics of “Killing me Softly” and wrote “Sway” which is based on “Quien Sera”) was tasked with completing the American version. The question of who would sing it arose pretty quickly. The answer? Well, the only one of the Brazilians who could speak English well. Astrud Gilberto, guitarist João Gilberto’s wife. A major reason why the song became popular, in my opinion, is because of the innocent, soft, and accented singing of Gilberto, who had never sung professionally prior to the song’s release. The nervous delivery and subtle mispronunciation of some words did not detract from the song, they benefitted it. So let’s all celebrate one of the most known bossa nova hits ever. ← While We’re Up Can We Get Some Power Pop? You almost got it right…almost. Norman Gimbel didn’t translate “Quen Sera” his lyric for ‘SWAY” was totally an original concept and lyric. And as for The Girl From Ipanema, that too was a totally original lyric “inspired by the translation of the title only. Very interesting. Didn’t realize that. Thanks for the correction and I made an update.